Outside of the big cities in European Russia, most Russians travel from place to place by train; there are few good roads west of the Urals. On my own Trans-Siberian journey, I found that there’s an art to riding the line. Unexpected essentials included a mug, slippers, a spoon, and food to share with my compartment mates. It took some experimentation to decide if I was a top-bunker or bottom (I’m a top). Over the three months I spent traveling in Russia, I found new and creative ways to befriend the provodnitsa, the carriage attendant who has a profound effect on the comfort of your journey. Beyond the practical, the books listed below deepened my understanding of the place and gave context to my experience. They also provided endless fodder for the deep political, social, economic and philosophical discussions I had with my fellow riders…few of whom spoke any English and all of whom assumed I’m a CIA agent. Thank goodness for my phrasebook! Engaging, charming and thoroughly opinionated, Murphy captures the spirit of the Siberians she meets with her trademark no-nonsense storytelling and vivid descriptions. Her point of view is proper yet not priggish, firm yet flexible, and incredibly well researched. Plus she’s never without a bottle of beer at her writing table. Like a beloved grandma dispensing tough love, she seems to assure us that she knows better. Often, she does. Taut, tense, and melancholy, Thubron captures the Siberian traveler’s mood and Siberia’s moodiness. He cuts the stories of characters he meets – reticent and suspicious by habit – with his own remarkably deep knowledge of Russian culture and history. The result is a fuller view of life in Siberia, woven together into a stark history of 20th-century Russia east of the Urals. The stories will leave you depressed enough to join thousands of Russians at the bottom of a bottle (well, millions according to this study): the murder and burial site of the last Russian czar and his family, a doctor banished to the poverty and despair of the Arctic north, one of the last surviving shamans in the republic of Tuva, a frustrated scientist in Akademgorodok. Makes for a good book, but when you actually visit you’ll find Siberians’ negativity tempered with a stubborn consciousness of the art and beauty of life. In 1991, Hudgins and her husband, both university professors at the University of Maryland, were among the first western faculty to participate in a teacher-exchange program with Vladivostok’s Far East University. The Other Side of Russia is a fascinating first-person account of real life in early post-Soviet Russia. The Peterburgian’s famous account of one exile’s life in a Siberian labor camp. It’ll make the sadistic provodnitsa in your train carriage seem like a doting mother in comparison. Part travel narrative, part international thriller, part mystery novel, Tuva or Bust! is Ralph Leighton’s tale of his and Richard Feynman’s decade-long attempt to gain entry into the province of Tuva, in south-central Siberia, during the waning days of the Soviet Union. Entertaining and informative, the story features bongo-drumming physicists turned diplomats, shamans captured on triangular stamps, and outlandish communication by telex in broken English and Tuvan. Though it’s not strictly about the Trans-Siberian line, this book reveals the systemic isolation of Siberian provinces: even today, the only transportation into Tuva is by broken mountain road. Reading this book will also help you keep patience as you navigate the arcane, contradictory and corrupt Russian visa-application process. Sure, it’ll take you months to earn that visa. But these clever men tried for 12 years. Spoiler alert: Feynman never even made it. 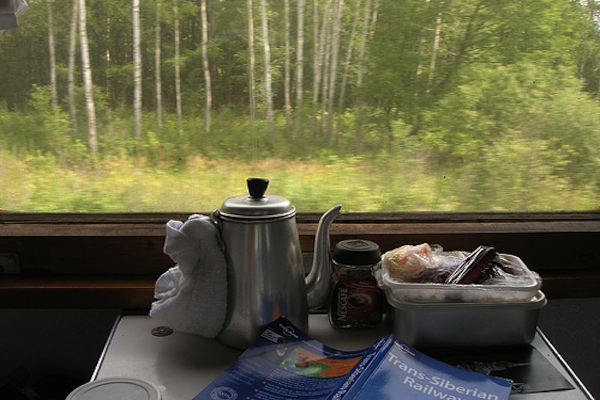 This Trailblazer guide offers a detailed the history of the Trans-Siberian, useful tips for planning and taking the journey, and painstaking detail of the sites and stops for every kilometer of the 9259-kilometer line. It’s not a guide book so much as an extremely knowledgeable tour guide – and one that won’t force you to visit his cousin’s rug-weaving factory. Don’t leave Moscow without it. Read more titles under our Focus on Travel Reading resource.